Our desire is to follow Christ faithfully in fulfilling the Command of the Great Commission. It is, therefore, our objective to make disciples of all nations, beginning in Birmingham, Alabama, and extending to the farthest reaches of the world. As a Southern Baptist Church, we are committed to working cooperatively in pursuing this objective. We support missionaries sent out from our church and other SBC churches through the Alabama State Board of Missions, the North American Mission Board, and the International Mission Board. Financial support is given through the Cooperative Program and the Lottie Moon Christmas Offering. In addition to our giving, we are actively engaged locally, nationally, and internationally in mission projects through the sending of short-term mission teams. Throughout these travels First Baptist Church has been our home church and our family. We were overjoyed when, in August 2015, we were invited to come on staff. It is a privilege to serve this loving fellowship alongside a committed and gifted staff. I am reminded daily that God “has reconciled us to Himself through Jesus Christ, and has given us the ministry of reconciliation…” (2 Cor 5:18). 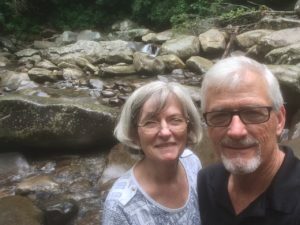 I enjoy sipping a good cappuccino, hiking with Susan in the mountains, spending time with my grandkids and ‘making stuff’ – ranging from stained glass to carpentry to bathroom remodeling. We do have a white German shepherd (Gretel)… and lint rollers in every corner of the house. If you visit, don’t wear black.